Tropicanna® canna is a brand name, and that is how most people know the plant pictured in my photo. For purposes of plant taxonomy, however, the plant is actually known as Canna 'Phasion.' The latter is the cultivar name, while the former is the genus name. "Canna" doubles as the common name; when used this way, we do not capitalize or italicize it. In terms of botany, cannas (or "canna lilies," as they are sometimes called) are perennials in planting zones 8 to 11. They are considered "tender" perennials, being sub-tropical and tropical flowers. The above-ground growth springs from underground rhizomes. As you can see from my image, canna plants do produce an attractive flower. In my growing zone (5), they typically bloom in the second half of July. Tropicanna bears a flower that is orange or salmon in color. Other commonly-grown types have yellow flowers; for example, C. indica var. flava. Still other kinds of canna have red flowers, including C. 'The President.' Somewhat less common but also readily available are types that have pink or even bicolored flowers. Nonetheless, most gardeners who grow Tropicanna canna consider them primarily outdoor foliage plants, with blooms being a bonus. The variegated leaves are what makes it special. Each leaf is tightly wound up in the shape of a long tube initially and is purple. It is entertaining to watch it as it unwinds. Once the leaf surface is fully visible, you will see it contains a pattern of stripes in four colors: purple, red, green, and yellow. These are fast-growing plants that can reach anywhere from 2 to 6 feet in height. Just how tall your Tropicanna becomes will depend on conditions. For example, since I grow mine in a relatively small pot and do not fertilize much, it attains a height of only about 2 feet. But folks who grow the same plant in the ground and fertilize faithfully will likely see a 6-foot plant. According to the Smithsonian, there are 58 species of canna lilies, which originated in tropical and subtropical portions of the New World. C. indica is the most common species. They are distant relatives of bird-of-paradise (Strelitzia reginae). Grow this plant in full sun. Ensure that the soil is kept evenly moist. Add humus to increase fertility. This is reputedly a clay-tolerant plant, but I grow mine in well-drained soil. If you garden in zone 7 or colder, you must wait until after all danger of frost has passed before planting canna rhizomes outdoors. If you keep your canna in the same pot (which you store in a basement to overwinter it) year after year, you may have some sprouts pop up prematurely in spring. Resist the temptation to bring the pot outside and leave it if there is still a possibility of frost. While waiting for the weather to cooperate, grow your canna in a sunny window, making sure to keep the soil evenly moist. You can take it outdoors on warm days, but remember to bring it back in at night. Canna lilies are commonly used in the North to lend a landscape a tropical feel during the summertime. Tropicanna, in particular, is highly valued for its tropical foliage. Moreover, the flowers will draw butterflies and attract hummingbirds. As container plants, they can be grown either on their own or in mixed plantings. Such containers work well on sunny patios and decks. The fact that cannas like a soil that is a bit on the wet side make them good water garden plants, as long as they are grown at the edge of your pond (as opposed to right in the pond) and the ground drains well. As a summertime plant in the North, canna (in our experience) does not suffer very much from pests or diseases. At most, you may occasionally have to kill slugs and snails to protect your plants. You may want to deadhead Tropicanna to encourage additional blooming. 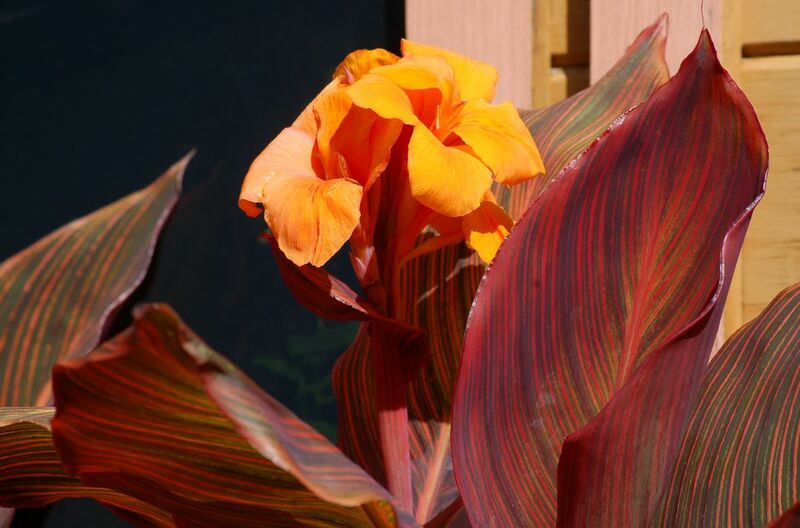 Most of the care for Tropicanna canna comes in the form of watering it during the summer. Other than that, Northern gardeners mainly have to remember to start overwintering the plants after the first killing frost in fall and to be careful about removing them from their winter storage to reintroduce them to the outdoors the following year. We tell you all about storing canna for winter here. The process is similar to that for storing dahlia bulbs―another tropical plant. What Long-Blooming Perennials Should You Have In Your Garden?